Maverick’s Finder menu is packed with useful goodies, most of which are available in its menus. These goodies include About Finder, Preferences, Hide Finder, Show Preferences and many more! About Finder: Choose this command to find out which version of the Finder is running on your Mac. This menu item isn’t particularly useful — or at least not for very long. But when a different application is running, the About Finder item becomes About <application name> and usually gives information about the program’s version number, the developers, and any other tidbits that those developers decide to throw in. 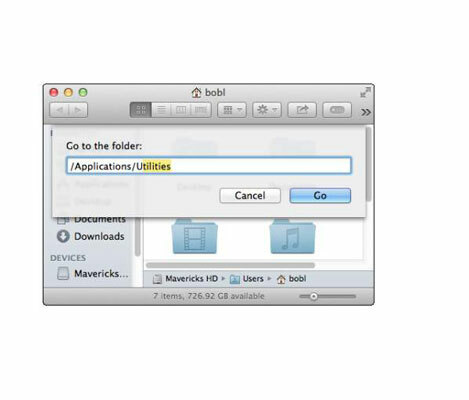 Services: One of the really cool features of OS X applications is the accessibility of Services. If nothing is selected in the Finder, the Services menu is empty. When an icon or icons are selected, there are two Services you can choose. Finally, if a word or words are selected, you have a myriad of options. Hide Finder (Command+H): Use this command when you have Finder windows open and they’re distracting you. Control-click and hold the folder’s name (Desktop) in the title bar. A pop-up menu appears, with the current folder at the top. 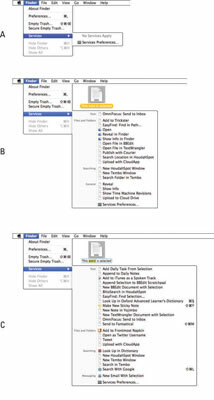 The Control-click shortcut is new in Mavericks; in all previous versions of OS X it was Command-click. Select any folder in the menu, and it becomes the highlighted folder in the current window; release the mouse button, and that folder’s contents are displayed. The contents of the Desktop folder — a file and a folder — are displayed in the window. If you release the mouse button, the contents of the highlighted folder (bobl) will appear. Last but not least, this trick doesn’t just work on Finder windows . . . it also works with the title bar in most document windows, showing you the path to the folder containing the document you’re working on. The Go menu is chock-full of shortcuts. The items on this menu take you to places on your Mac — many of the same places you can go with the Finder window toolbar — and a few other places. Back (Command+[): Use this menu option to return to the last Finder window that you had open. It’s equivalent to the Back button on the Finder toolbar, in case you have the toolbar hidden. Forward (Command+]): This command is the opposite of using the Back command, moving you forward through every folder you open. Remember that if you haven’t gone back, you can’t go forward. 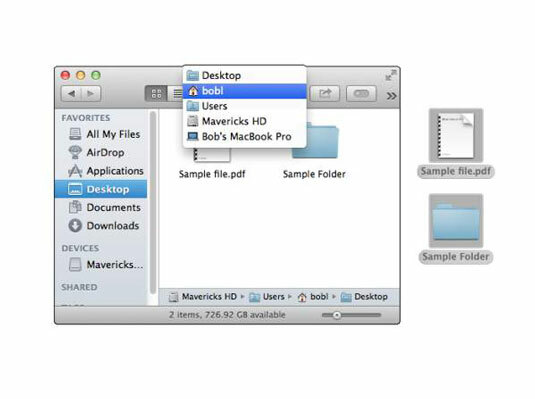 Enclosing Folder (Command+up-arrow): This command tells the Finder window to display the folder where the currently selected item is located. *All my Files (Shift+Command+F): This command shows you all your document files at once. Documents (Shift+Command+O): You’ll probably use this command often because the Documents folder is a great place to save documents you create. Desktop (Shift+Command+D): Use this command to display the Desktop folder, which contains the same icons as the Desktop you see behind open windows. *Downloads (Option+Command+L): This opens your Downloads folder, which is where files you download in Safari, save as attachments in Mail, or receive via AirDrop (explained shortly) are saved by default. Home (Shift+Command+H): Use this command to have the Finder window display your Home folder (which is named with your short name). Computer (Shift+Command+C): This command tells the Finder window to display the Computer level, showing your Network and all your disks. *AirDrop (Shift+Command+R): AirDrop lets you share files wirelessly with anyone around you. Bear in mind that not all Macs capable of running Mavericks support AirDrop. If your Mac is 2009 vintage (or older), AirDrop might not work. Network (Shift+Command+K): This command displays whatever is accessible on your network in the Finder window. Applications (Shift+Command+A): This command displays your Applications folder, the usual storehouse for all the programs that came with your Mac (and the most likely place to find the programs you install). Utilities (Shift+Command+U): This command gets you to the Utilities folder inside the Applications folder in one fell swoop. The first character you type must also be a forward slash, unless you’re going to a subfolder of the current window. Connect to Server (Command+K): If your Mac is connected to a network or to the Internet, use this command to reach those remote resources.